I love infused water. It’s a refreshing way to enjoy your water, and much healthier way to add some flavor than something like Mio or other store-bought water additives. 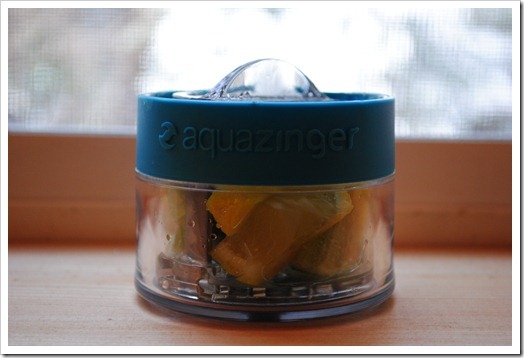 So, when I discovered the Aqua Zinger – a personal infused water maker — I contacted the maker immediately letting them know I would like to review their product, and asking if they would sponsor a giveaway. This review is only on the Aqua Zinger, but Zing Anything has a product line that includes a Citrus Zinger, Salad Zinger, and Vodka Zinger. 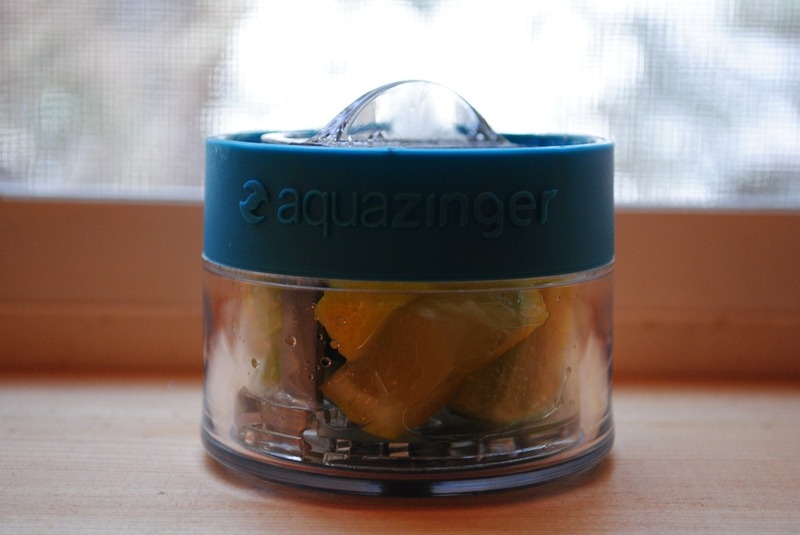 For what it’s worth, the Aqua Zinger also works fine with citrus, you just have to cut it up into smaller pieces, whereas you don’t have to this with the Citrus Zinger, which works with half of a citrus. 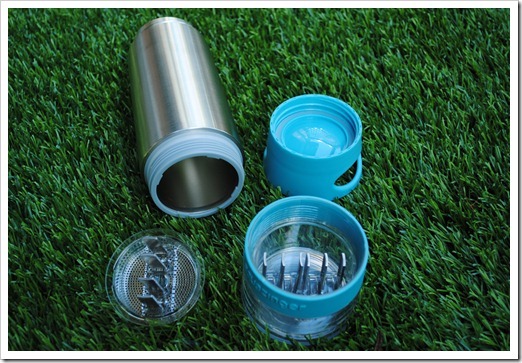 A stylish stainless steel water bottle with a small “grinder” cup on the bottom that allows you to make infused water in a very on-the-go friendly way. Forget Vitamin Water or other fruity water drinks made with artificial flavors and sweeteners. The Aqua Zinger lets you your own infused water to suit your tastes, and the sky is truly the limit in terms of combinations you can make. I am very anti-artificial flavors or colors, so this is really a fantastic solution to flavored water. 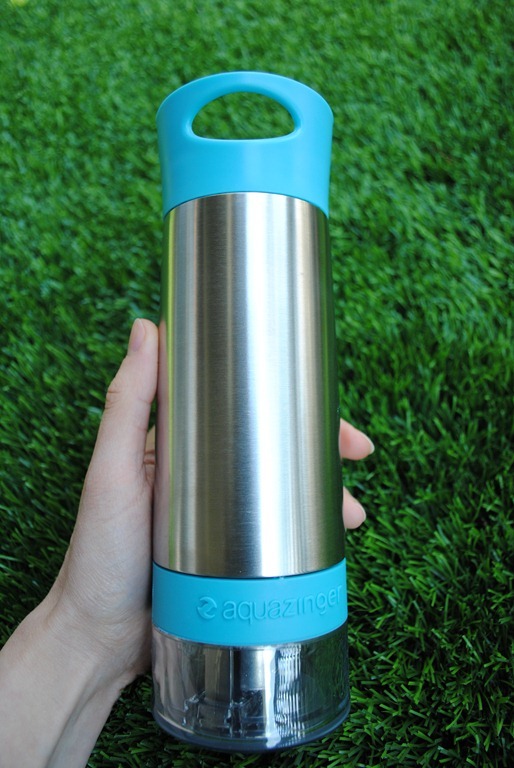 The Aqua Zinger retails from $25-30, depending on where you find it, and comes in four colors: Blue, pink, green, and grey. This is the really interesting part. There is a small cup with little tines in it that screws onto the bottom of the bottle. The action of screwing this cup onto the bottle grinds the fruit, vegetables or herbs (or combination of all) that you have put into the cup. There are small perforations in the top of the blade lid that allow water to flow between the flavorings and your water, and, by shaking the bottle, you can infuse those flavors into the water. This lets you have flavorings without actually having the fruits or veggies in the water. It’s so simple, it’s brilliant. The bottle itself is made of a sturdy food-grade, safe stainless steel. 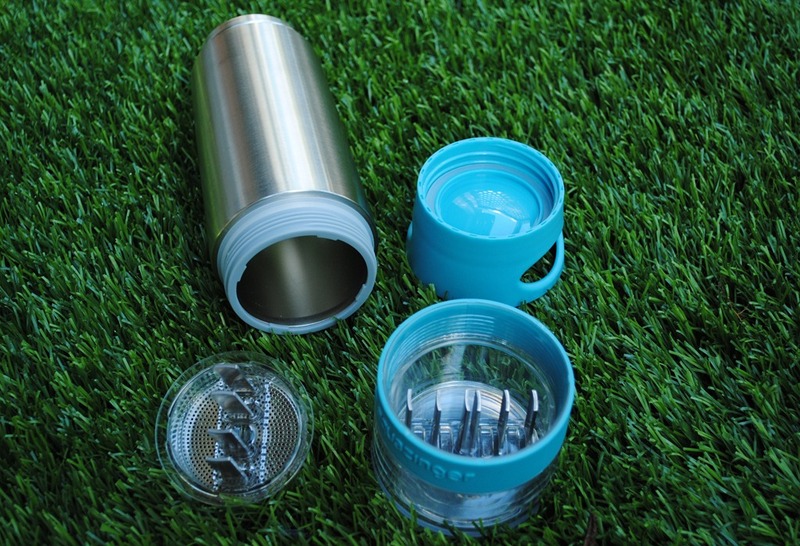 The grinding cup is made of BPA-free plastic. By the way, there is a “bottom” and a “top” to the cup, which perform the grinding action once you have loaded in your flavor combinations. And, the lid is also made of BPA-free plastic. I have to admit, before I had one of these in my grubby little hands, I wasn’t sure what made it so much better than traditionally infused water. But, it is so neat! Someone suggested to try durian, and while I am generally open to new food suggestions, I simply couldn’t find any (and am slightly scared of durian, if we’re speaking the truth!). Another reader (and friend of mine) suggested a Pomegranate mixture, but I have a sensitivity to the Pom (sad), so I had to skip that one. I have to say, the simple, solo cucumber has always been and remains my favorite. It is so refreshing and reminds me of being at a spa. But, there really is no limit to the flavor combinations you could do. The Zinger folks have lots of recipes, so I won’t recreate those here, but here is a list of all the things you could think about zinging (not necessarily together, just a list of things that could be zinged). Getting the right touch to screw the bottom cup onto the bottle takes a bit of getting used to, but once you’ve don’t it a couple times, it’s very easy. The challenge is that you need to fill the cup full with your flavorings to maximize the flavors, and so screwing it on can make it seem like you run into hang ups as the cup is grinding. In reality, if you just keep screwing it on, it will get past the speed bumps no problem. 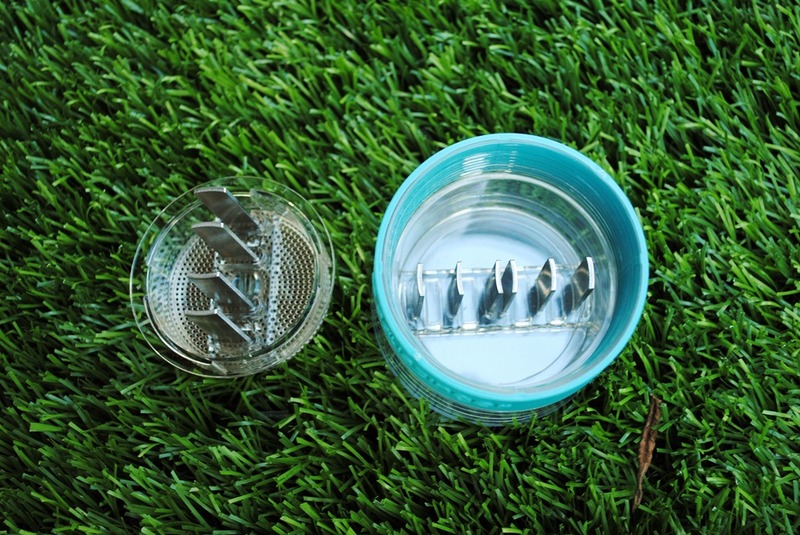 The Zing Anything recommend that you unscrew the cup one or two times and re-screw it on to better grind your flavorings. This is not a big deal at all, and once you figure out how to successfully screw it on, it gets easier each time. They say you can do two “zings” with the same flavorings, but, I did three sometimes without issue. You could experience slightly less flavor each time you re-use your flavorings. I found citrus seemed to be the most pliable to doing multiple zings, but, peach was kind of a one-and-done proposition. 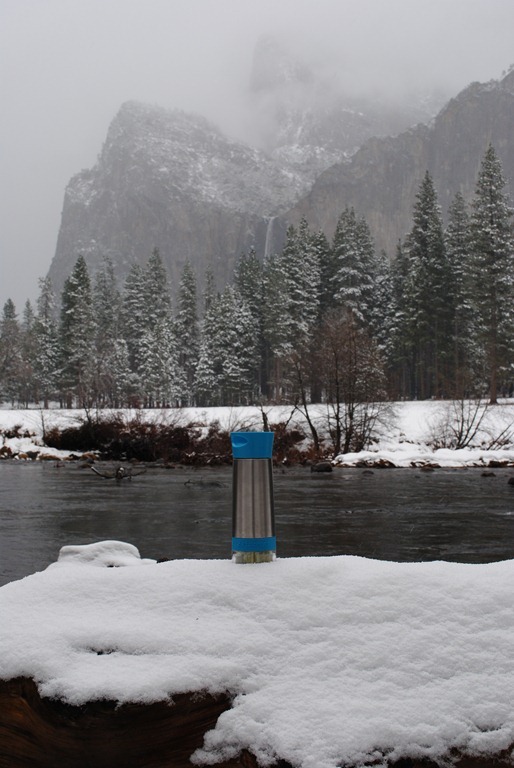 You can use it to create both hot and cold beverages. 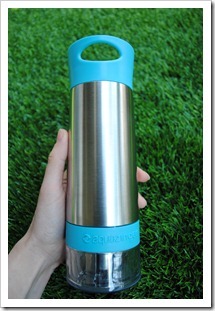 Naturally-flavored tea is really easy to do, and since it is a stainless steel bottle and durable thick plastic grinding cup, you are in good shape for traveling with your creation. Ideally, you should completely peel the fruits and veggies you are using to help protect the blades, though, they say you can add a small amount of rind to each zing. To be honest, I did one zing with lemons and limes with their entire rinds intact, and it worked out just fine, but they don’t recommend you do this! I was just kind of “battle testing” the product to see what would happen if you didn’t heed that warning. The grinding blades may look intimidating, but they are not sharp like a knife. They grind, but don’t cut per se, so they are nothing to fear. When you are done with a flavor combination, just fling the refuse into your compost bin or trash, and rinse the grinder cup and bottle. 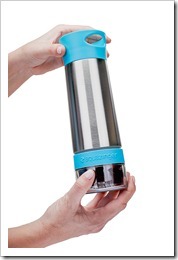 According to the documentation, the Aqua Zinger is top rack dishwasher safe. Since we are currently in a major remodel and do not have a dishwasher, I wasn’t able to test this element for you super thoroughly. I ran it through the dishwasher in the cabin we were staying in Yosemite, and it came out fine, so I am going to say it is just fine in the dishwasher. 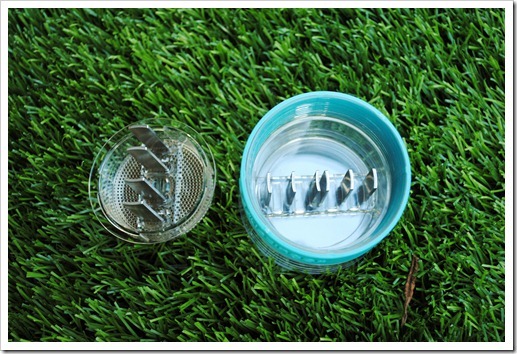 However, it is really easy to hand wash as well, just be careful with the grinding blades, while they aren’t knife-sharp, if you forget you are working with metal, you could accidentally scrape yourself. 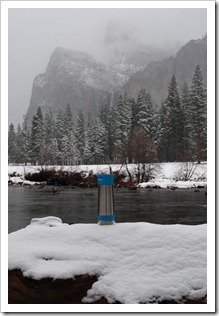 Here is a Quick Tips PDF, which includes a lot of valuable information to help you successfully “Zing” your water. They also have a video tutorial here, for those that would rather watch than read. There is an endless possibility of flavor combinations, only limited by your imagination, and the Zing Anything folks have provided a ton of example recipes on their website, so if you don’t want to get creative, you can follow their lead. Really nice looking, durable bottle! The base of the bottle is just slightly too large in diameter to sit comfortably in either of our car cup holders. This is not the end of the world, but it would be nice if it sat snugly in the cup holder. We have average cars (a small SUV and a hatchback), so I feel like they are a decent representation of what most people have. If you have a big pickup or Suburban type vehicle, odds are it will fit fine. While this is not what I would call an essential kitchen gadget or appliance, it definitely is a value-add item that can make getting your daily water intake a breeze. By flavoring water with fresh fruits and veggies, you can add a little zing to your drink without the calorie, artificial ingredients, or other undesirable aspects of store-bought drinks. Infused water feels like such a treat that you will look forward to creating and drinking (at least I do)! 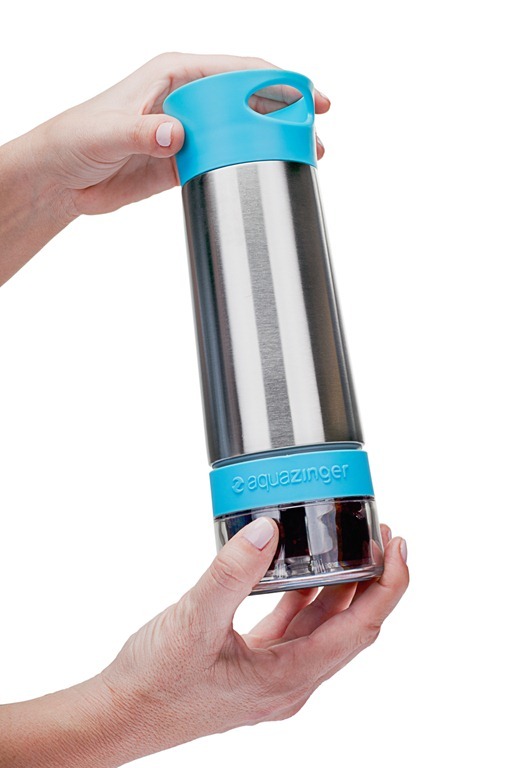 One lucky winner is going to get a complimentary Aqua Zinger directly from the folks at Zing Anything. A zinger just like this one could be yours, and I think this is so awesome! Leave a comment below letting us know your favorite infused water combination, or, what you would make if you win the Aqua Zinger. I’ll hold a random drawing of entries using Random.org, and the contest will run from today, February 13, 2013 until next Wednesday, February 21, 2013 at 11:59 p.m. PST. I’ll announce the winner by EOD Thursday. Good luck to all who enter, and let me know what you would zing! You should know: I am not affiliated with the maker of the Aqua Zinger, however, I did ask them to send me a sample to review. All thoughts and opinions expressed in this review are my own, and were not at all influenced by the maker. If you found this review helpful and decide to purchase an Aqua Zinger, using this Amazon link puts a few pennies in my pot to support future reviews. I like to use cucumbers infused in my water in the summer, usually just use lemons though. I would zing oranges and lemons and strawberries! I like to slice little bits of ginger and add into my water, along with a chunk of fresh lemon, for its anti-inflammatory properties. It sounds like the Aqua Zinger would help in extracting more of the ginger, while not over-doing it (as with a zester). I have to admit I just don’t like water and therefor don’t drink anywhere near the recommended daily amount. Flavored water seems so much more appealing. 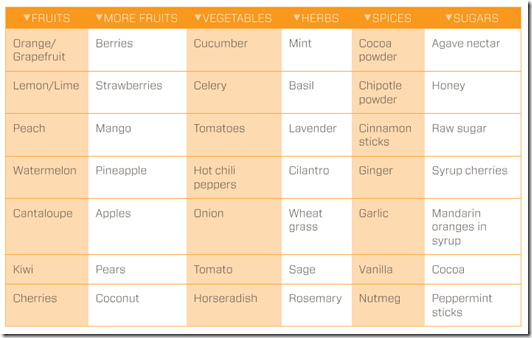 I would first of all try cucumber or ginger infused water–maybe both together! It is a fight for us to get our 10 year old to drink water. She just does not like, and I can’t blame her, I was the same way until about 5 years ago. 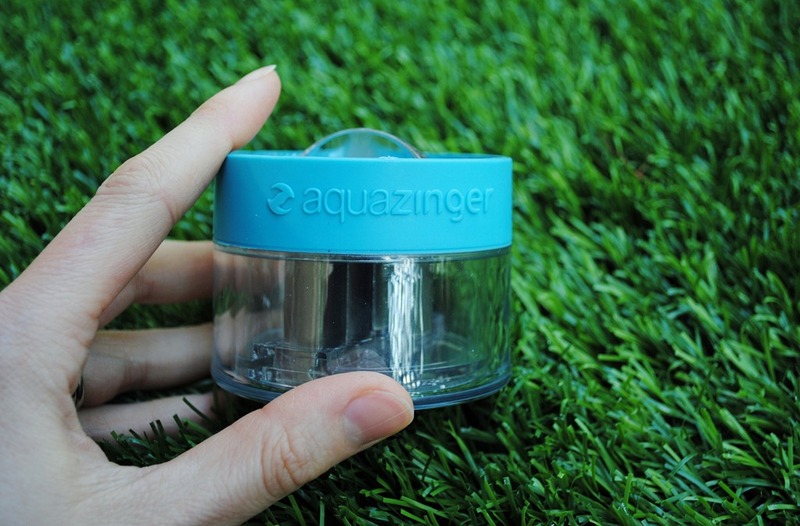 Having an aqua zinger would be a great way to make water she will drink and enjoy. I would like to try pomegranate, and I think Asian pear would be delicious. Actually the two together sounds good! I would love to try a cilantro and lime combo. Living in Arizona we see this combo everywhere and I bet it would be very refreshing as a water flavor as it is with food. I would love to try lemon and the blueberry ginger. Thanks for all the great recipes. I love getting my kids involved with making healthier choices. 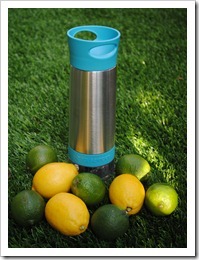 I would love to try the new Aqua Zinger for infusing my lemons I use daily in my green tea. I also love raspberry infused water. I have gotten off the soda and sweet drinks by infusing my water. The composting idea is an added plus. Thank you! I think I would like to try celery leaves (wintered over in your garden are best as they have that sharp celery flavor) with radish and wintered over parsley (same reason: they are filled out by the weather changes and are more “parsley” flavored). Add a couple of leaves of rosemary and you are good to go! A real zingy morning-starter type of drink! 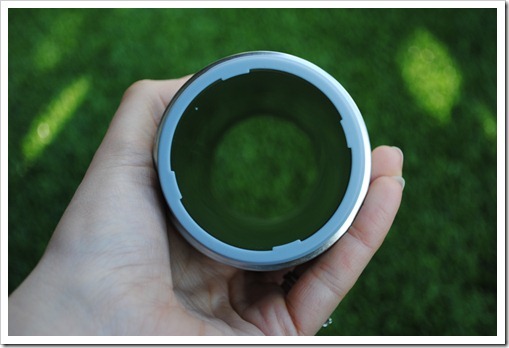 It’s looks like a wonderful gadget! I have lots of ideas….starting with throwing a couple of frozen strawberries, love the thought of fresh mango and fresh mint! Lemon since it is smart to start the day with lemon water! Plus I would be curious about raspberries – loooove them, have them in the garden, need to find things to do with them. I would try raspberries first, maybe with lemon. Probably more often (just because of cost), I’d use cucumber and mint. 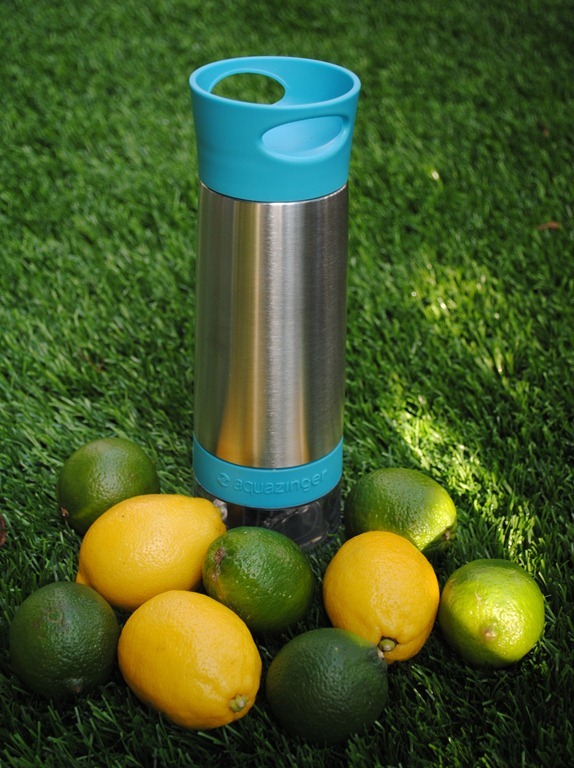 limes and lemons…can’t beat it during the warmer months! Thanks for opportunity to win this! I would zing lime, lemon, oranges!! My favorite is cucumber and mint! I would zing ginger and lemon tea! I can never find a really good ready made ginger tea, so this product would be awesome! I have wanted one of these so badly but it’s been hard for me to justify the price. I work 12 hour shifts as a nurse and it is hard to stay hydrated! Hopefully this would help motivate me to drink more . I think I would zing watermelon and mint, and kiwi and strawberry. Or blueberries and lemon!! This is the first time I’ve seen this-what an awesome idea! I usually use lemon or lime wedges in my water but this gives me so many ideas. 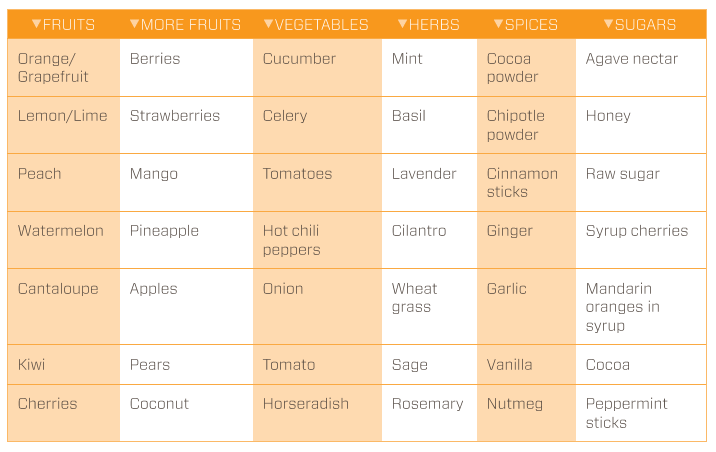 I’d probably try any fresh fruits I have around, but I’d experiment with herbs and ginger too. 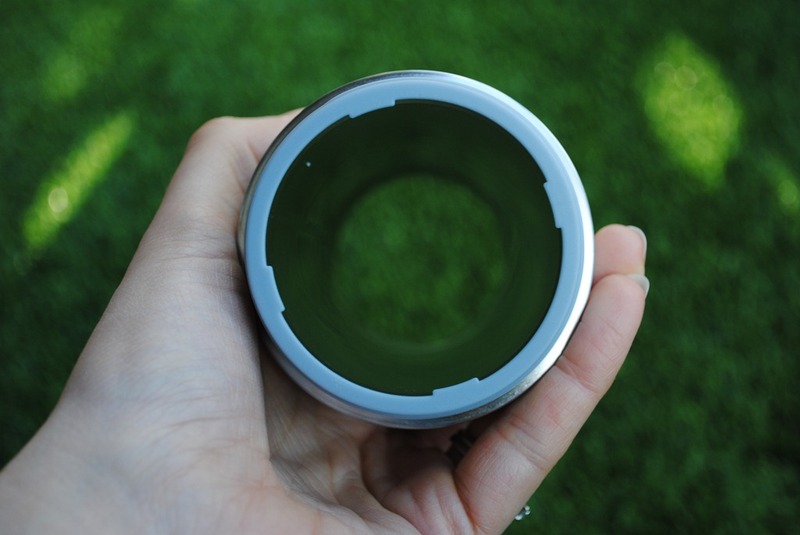 this would be great for kicking any sugary drink habits-no more boring plain water! I would really appreciate an Aqua Zinger. I have grapefruit, Valley lemon (Meyer), key lime, papaya, and avocado trees in my yard, and the infused water would be so much better for me than the straight sugar filled juice. In the winter we grow watermelons, honeydews, and cantelopes, cucumbers… Fruit and veggies are cheap and plentiful here. What I really would like to try is tamarindo infused water. Mouth watering just thinking of all the things I could do with this baby! I know the dates are old, but are you still doing this? I just started drinking infused water regularly and I am intrigued by this product! I usually have cucumbers, lemon and mint going – very refreshing! 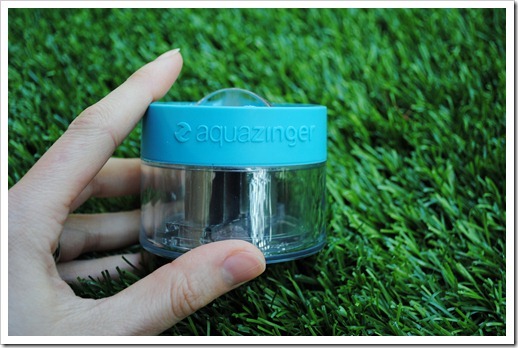 Sorry, this promotion is over, but I highly recommend the Aqua Zinger if you like infused water! I would zing strawberries and basil!